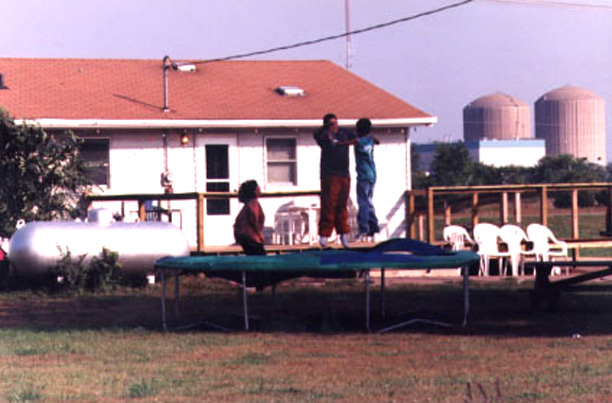 The Prairie Island Indian Community appears to be the first Native American community to buy land and make emergency evacuation and relocation plans under the threat of living next door to nuclear power plant reactors and stored radioactive fuels. The PIIC Tribal Council announced in March that it had purchased 112 acres of land east of St. Paul for possible future development. This was a precautionary action in the event of a nuclear event with either the power plant or continuing radioactive waste storage at Prairie Island. On June 6, PIIC applied to the Bureau of Indian Affairs to have the newly acquired land placed in federal trust in the event the community must vacate its ancestral island homeland. The importance of this step became obvious on June 3 when the U.S. Court of Appeals in the District of Columbia ruled that spent fuel rods from the power plant may remain indefinitely on the island – unless the federal government finds a suitable depository somewhere else that no one wants. 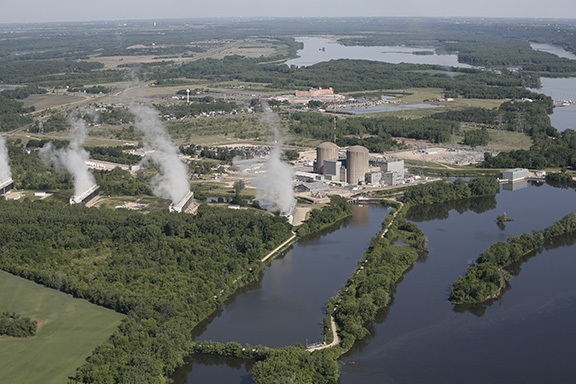 Tribal Council President Shelly Buck said the community and its allies among states, utilities and environmental groups in ongoing litigation are unaware of any other tribal entity that has taken such steps from a nuclear threat. Robert Holden, deputy director of the National Congress of American Indians (NCAI) in Washington, D.C., said other tribal entities across the country are close enough to nuclear plants and hazardous sites to be concerned for safety. “But none are as close as Prairie Island,” he said, noting that the power plants and stored fuel waste are only 600 yards from PIIC homes and businesses. There are tribes in Arizona and tribes concerned for water safety and salmon fisheries in Washington state that are too close for comfort, he said. No other group is literally “living next door” to a site that could become another Chernobyl (1986) or Fukushima (2011) nuclear disasters. Recognizing the threat, the 2015 Minnesota Legislature authorized PIIC to purchase and seek federal trust land protection of up to 1,500 acres for relocation purposes within a 50-mile radius of Prairie Island. That status brings new PIIC property holdings back under tribal sovereignty protection. These cautionary steps are a first in coping with a potential nuclear threat. They are not, however, the first moves taken by Native Americans and indigenous people around the globe to cope with environmental threats created by human behavior and development. With grants from the Department of Housing and Urban Development (HUD), the Isle de Jean Band of Biloxi-Chitimacha-Choctaw is moving off its Gulf Coast island to higher ground inland in Louisiana, reacting to the gradual loss of more than two-thirds of its land to rising water levels. For the same reason, nearly three dozen Native Alaskan villages are in the process of being relocated to higher ground. A master plan for emergency responses and relocation is underway at the Quinault Indian Nation on the Olympic Peninsula in Washington State that is threatened by rising ocean waters, the possibility of tsunamis and melting glaciers that contribute to river flooding. NCAI’s Holden said Nevada and Utah tribes have consistently fought the federal government’s plan for using Yucca Mountain as a nuclear fuel storage site. They are painfully aware their lands and ancestral homes were exposed to radiation from atomic bomb testing in the early years of the Cold War. Tribes in Washington and Oregon with fishing rights and living along the Columbia River are constantly concerned about reoccurring leaks at the Hanford Site that developed plutonium and bombs for World War II and the Cold War that followed. Such human behavior and development near indigenous peoples are not unique to North America. The World Wildlife Fund based in Washington, D.C. cites studies estimating 15 percent of all greenhouse gas emission that in turn raise global temperatures and sea levels are the result of deforestation. These studies estimate that 17 percent of the Amazon tropical rainforests have been lost in the last 50 years from fires, clear-cutting for agriculture, ranching and development, unsustainable logging for timber, and, in turn, from degradation due to climate change that these actions are causing. Writing for the University of Minnesota’s online Ensia journal and for LatinAmericanScience.org in June, Victoria Molina noted that two Honduran environmental and indigenous peoples’ leaders were recently assassinated. This after 109 of their counterparts were killed between 2010 and 2015 for opposing dams, logging, mining and agricultural projects in Honduras. In comments similar to PIIC’s Buck, Kiribati President Anote Tong explained to Australian and Fijian news media that the purchase was for future development and possible relocation of its 110,000 people threatened by rising sea levels on their 33 native islands. In all, United Nations and global organizations estimate 10 nations may need to take similar actions because holding back the rising oceans from floods is becoming too costly. Politicians serving the causes of special interests can split hairs over climate change, rising sea levels and other threats brought by human behavior and development. For Native Americans and indigenous people elsewhere, these arguments are irrelevant. The consequences, inevitably, are real and housed in their backyards.